Blog - Queen's Beast Black Bull of Clarence Pre-Sale Starts Now! When Queen Elizabeth of England was coronated, ten statues were created for the celebration. Each celebrated a different branch of her lineage and family heritage. The statues, known as The Queen’s Beasts, have now been brought to life in precious metals. The UK’s Royal Mint has created a series of silver, gold and platinum coins that celebrate these statues. There are ten designs in total – and fifth edition of this series is about to arrive! The Queen’s Beasts series launched in 2016 and has been wildly successful ever since. The coins have developed a tremendous following both among collectors and investors. Although the coins are priced upon release as bullion items, they have become increasingly valuable as numismatic items. The first few issues in the series, for example, are now selling for significant premiums over melt. The2016 2 oz silver Lion of England, for instance, was issued at a $2.75-$3.00 premium per ounce. Nowadays many dealers are quoting 4x that premium for the same coin! If you want to acquire Queen’s Beasts coins at the lowest premium, it’s best to grab them immediately upon release. Prices are reasonable when the coins first arrive, but have a track record of appreciating dramatically as time goes on. This is why we’re alerting you now. 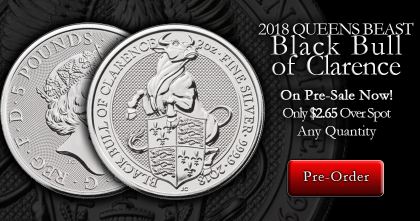 Starting today, you can lock in the fifth coin in the Queen’s Beast series: the 2 oz silver Black Bull of Clarence. This all-new coin is about to make landfall within the next two weeks, but you can reserve your spot at the head of the line today! Take advantage of special pre-sale pricing and lock in at low premiums. We’re offering this beautiful new coin at $2.65 per ounce over spot for any quantity! Considering how earlier 2 oz pieces are already fetching 4x-5x this premium, we advise you to act while prices are low. Looking for the gold versions of the Black Bull of Clarence? We have those on the way too! This new design is also being released as a 1/4 oz and 1 oz gold coin. Our first wave of inventory is expected to arrive the second week of March.